Darth Vadar and his minions stepping over the trash. This is the card of temptation ("Luke! Come to the Dark Side!"). There's a lot of power on the Dark Side, plus life seems a lot easier and more amusing over there. Good guys seem to work so hard. This is also the card of ignorance, because, of course, the temptation is an illusion. Power and work coexist on both sides of the force. 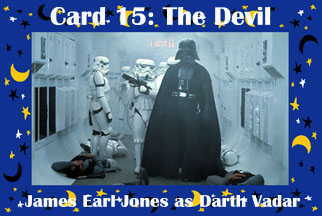 Even Darth Vadar is an illusion; the actor wearing the tin can suit is David Prowse, not James Earl Jones. Darth Vadar picture diabolically ripped away from Welcome Cadet to the Dark Side.